"Dravid" redirects here. For other people with the same surname, see Dravid (surname). Rahul Sharad Dravid (/ˌrəhuːl drəvɪd/ ( listen); born 11 January 1973) is a former Indian cricketer and captain, widely regarded as one of the greatest batsmen in the history of cricket. He is the current Overseas Batting Consultant for the Indian team, and also the head coach for the Under-19 and 'A' teams. Dravid scored nearly 25000 runs in international cricket. He is colloquially known as Dependable or Mr. Dependable, and often referred to as The Great Wall or The Wall by Indian cricket followers. As of December 2016, Dravid is the fourth-highest run scorer in Test cricket, after Sachin Tendulkar, Ricky Ponting and Jacques Kallis. In 2004, after completing his century against Bangladesh in Chittagong, he became the first and the only player till date to score a century in all the ten Test-playing countries. As of October 2012, he holds the record for the most number of catches taken by a player (non-wicket-keeper) in Test cricket, with 210. Dravid holds a unique record of never getting out for a Golden duck in the 286 Test innings which he has played. He has faced 31258 balls, which is the highest number of balls faced by any player in test cricket. He has also spent 44152 minutes at the crease, which is the highest time spent on crease by any player in test cricket. In 2014, Rahul Dravid joined the GoSports Foundation, Bangalore as a member of their board of advisors. In collaboration with GoSports Foundation he is mentoring India's future Olympians and Paralympians as part of the Rahul Dravid Athlete Mentorship Programme. Indian badminton player Prannoy Kumar, Para-swimmer Sharath Gayakwad and young Golfer S. Chikkarangappa was part of the initial group of athletes to be mentored by Rahul Dravid. In July 2018, Dravid became the fifth Indian cricketer to be inducted into ICC Hall of Fame. Dravid was born in a Marathi Deshastha Brahmin family in Indore, Madhya Pradesh. His family later moved to Bangalore, Karnataka, where he was raised. His mother tongue is Marathi. Dravid's father Sharad Dravid worked for a company that makes jams and preserves, giving rise to the later nickname Jammy. His mother, Pushpa, was a professor of Architecture at the University Visvesvaraya College of Engineering (UVCE), Bangalore. Dravid has a younger brother named Vijay. He did his schooling at St. Joseph's Boys High School, Bangalore and earned a degree in commerce from St. Joseph's College of Commerce, Bangalore. He was selected to India national cricket team while studying MBA in St Joseph's College of Business Administration. He is fluent in several languages, Marathi, Kannada, English and Hindi. Dravid made his Ranji Trophy debut in February 1991, while still attending college. Playing alongside future India teammates Anil Kumble and Javagal Srinath against Maharashtra in Pune, he scored 82 runs in the match, which ended in a draw. He followed it up with a century against Bengal and three successive centuries after. However, Dravid's first full season was in 1991–92, when he scored two centuries and finished up with 380 runs at an average of 63.30, getting selected for the South Zone cricket team in the Duleep Trophy. Dravid's caught the national team selectors' eye with his good performances for India A in the home series against England A in 1994–95. Dravid, who had been knocking at the doors of Indian national cricket team for quite a while with his consistent performance in domestic cricket, received his first national call in October 1994, for the last two matches of the Wills World Series. However, he could not break into the playing eleven. He went back to the domestic circuit and kept knocking harder. So much so, that when the selectors announced the Indian team for the 1996 World Cup sans Dravid, an Indian daily newspaper carried a headline – "Rahul Dravid gets a raw deal". However, they could not ignore him any longer after the World Cup. Dravid made his international debut on 3 April 1996 in an ODI against Sri Lanka in the Singer Cup held in Singapore immediately after the 1996 World Cup, replacing Vinod Kambli. He wasn't particularly impressive with the bat, scoring just three runs before being dismissed by Muttiah Muralitharan, but took two catches in the match. He followed it up with another failure in the next game scoring just four runs before getting run out against Pakistan. Coming in to bat at no. 7, he forged important partnerships, first with another debutante Sourav Ganguly and then with Indian lower order, securing a vital first innings lead for his team. Batting for more than six hours, he scored 95 runs before getting out to the bowling of Chris Lewis. Dravid was just five runs short of a landmark debut hundred when he nicked a Lewis delivery to the keeper and walked even before umpire's decision. When asked about the walk, he quipped, "Everybody at the ground had heard the nick". He also took his first catch in Test cricket in this match to dismiss Nasser Hussain off the bowling of Srinath. In the next tour game against British Universities, Dravid scored a hundred. He scored another fifty in the first innings of the Third Test. Dravid concluded a successful debut series with an impressive average of 62.33 from two Test matches. I had played five years of first-class cricket to break into the Indian team ... scored a lot of runs in domestic cricket ... was lucky to get the opportunity ... knew that probably it would be the only one. Otherwise I would have to go back to domestic cricket and start the cycle all over again ... I remember when I was 50 not out at the end of the day ... walking back to the hotel with Srinath and I knew somehow that this was probably a very significant innings. I knew I had some more breathing space ... a few more Test matches at least ... gave me a lot of confidence scoring 95 here and 80 at Trent Bridge ... as a player and as a person. Rahul Dravid, reflecting back on his Test debut 15 years later, during India tour of England, 2011. After a successful Test debut in England, Dravid played in the one-off Test against Australia in Delhi – his first Test in India. Batting at no. 6, he scored 40 runs in the first innings. Dravid batted at no. 3 position for the first time in the First Test of the three-match home series against South Africa in Ahmedabad in November 1996. He didn't do too well in the series scoring just 175 runs at an average of 29.16. Two weeks later, India toured South Africa for a three–match Test series. Chasing a target of 395 runs in the First Test, Indian team bundled out meekly for 66 runs on the Durban pitch that provided excessive bounce and seam movement. Dravid, batting at no. 6, was the only Indian batsman who reached double figures in the innings scoring 27 not out. He was promoted to the no. 3 slot again in the second innings of the Second Test however, it was his breakthrough performance in the Third Test that secured his position as India's quintessential no. 3 batsman. He almost won the match for India with his maiden test hundred in the first innings scoring 148 runs and another 81 runs in the second innings at Wanderers before the thunderstorms, dim light and Cullinan's hundred saved the day for South Africa enabling them to draw the match. Dravid's performance in this Test earned him his first Man of the Match award in Test cricket. He top scored for India in the series with 277 runs at an average of 55.40. Dravid carried his good form from South Africa to the West Indies where he once again top scored for India in the five–match Test series that India lost 0–1. He scored 360 runs at an average of 72.00 including four fifties. 92 runs scored in the first innings of the fifth match in Georgetown earned him a joint Man of the Match award along with Shivnarine Chanderpaul. With this series, Dravid concluded a successful 1996/97 Test season, topping the international runs chart with 852 runs from 12 matches at an average of 50.11 with six fifties and one hundred. The Zimbabwe tour was followed by a tour to New Zealand. First Test having been abandoned without a ball being bowled, the series started for Dravid with the first duck of his Test career in the first innings of the Second Test and ended with hundreds in both the innings of the Third Test in Hamilton. He scored 190 and 103 not out in the first and the second innings respectively, becoming only the third Indian batsman, after Vijay Hazare and Sunil Gavaskar, to score a century in both innings of a Test match. Dravid topped the runs table for the series with 321 runs from two matches at an average of 107.00 but could not prevent India from losing the series 0–1. Despite his initial struggle in ODIs, there were quite a few highlights as well. Dravid tasted first success of his ODI career in the 1996 'Friendship' Cup against Pakistan in the tough conditions of Toronto. He emerged as the highest scorer of the series with 220 runs in five matches at an average of 44.00 and a strike rate of 68.53. He won his first ODI Man of the Match award for the 46 runs scored in the low scoring third game of the series. He top scored for India in the Standard Bank International One-Day Series 1996/97 in South Africa with 280 runs from eight games at an average of 35.00 and a strike rate of 60.73, the highlight being a Man of the Match award-winning performance (84 runs, one catch) in the Final of the series that came in a losing cause. He was the second highest run scorer for India in the four-match bilateral ODI series in the West Indies in 1996/97 with 121 runs at an average of 40.33 and a strike rate of 57.61. By now, Dravid had been branded as a Test specialist. While he continued to score heavily in Test cricket, his poor strike rate in ODIs came under scanner. He drew criticism for not being able to adjust his style of play to the needs of ODI cricket, his lack of attacking capability and play big strokes. However, Dravid worked hard and re-tooled his game by increasing his range of strokes and adapting his batting style to suit the requirements of ODI cricket. He learned to pace his innings cleverly without going for the slogs. He made his World Cup debut against South Africa at Hove striking a half century, but scored just 13 in the next game against Zimbabwe. India lost both the games. Having lost the first two games, India needed to win the remaining three games of the first round to have any chance of advancing into the Super Six stage. Dravid put up a partnership of 237 runs with Sachin Tendulkar against Kenya at Bristol – a World Cup record – and in the process hit his maiden World Cup hundred, helping India to a 94-run victory. India's designated keeper Mongia left the field at the end of 9th over during Kenyan innings, forcing Dravid to keep the wickets for the rest of the innings. In the absence of injured Nayan Mongia, Dravid played his first ODI as a designated keeper against Sri Lanka at Taunton. Dravid once again staged a record breaking partnership worth 318 runs – the first ever three hundred run partnership in ODI history – but this time with Sourav Ganguly, guiding India to a 157-run win. Dravid scored 145 runs from 129 balls with 17 fours and a six, becoming the second batsman in World Cup history to hit back-to-back hundreds. Dravid struck a fine fifty in the last group match as India defeated England to advance into the Super Six stage. Dravid scored 2, 61 & 29 in the three Super Six matches against Australia, Pakistan & New Zealand respectively. India failed to qualify for the semi-finals having lost to Australia and New Zealand but achieved a consolation victory against Pakistan in a tense game, what with the military conflict going on between the two countries in Kashmir at the same time. Dravid emerged as the top scorer of the tournament with 461 runs from 8 games at an average of 65.85 and a strike rate of 85.52. He capped a successful World Cup outing on personal front with a commentary stint during the World Cup Final which resulted in him getting reprimanded by the BCCI for appearing on television without board's permission. He received CEAT Cricketer of the World Cup award, later that year. Dravid kick-started his post World Cup Test season with a decent outing against New Zealand in the 3-match home series. His best effort of the series came in the second innings of the First test at Mohali scoring 144, helping India salvage a draw after being bowled out for 83 runs in the First innings. Before this innings, Dravid had five test hundreds to his name from 29 tests, all of which came in away tests, this being his first test hundred on Indian soil. Dravid did well in the 3–2 series win against New Zealand in the bilateral ODI series, scoring 240 runs in 5 games at an average of 60 and a strike rate of 83.62, ending as the second highest scorer in the series. His career best effort in ODIs came in this series in the second game at Hyderabad where he scored run-a-ball 153 runs which included 15 fours and two sixes. He featured in a 331-run partnership with Tendulkar, which was the highest partnership in ODI cricket history, a record that stood for 15 years until it was broken in 2015. With this series, Dravid ended an eventful year, as far as his ODI career was concerned, on a high note. In 1999, Dravid scored 1761 runs in 43 ODIs at an average of 46.34 and a strike rate of 75.16 including 6 hundreds and 8 fifties and featured in two 300+ partnerships. Dravid's poor form in Tests continued as India suffered a 0–2 whitewash against South Africa in a home series. He had moderate success in the bilateral ODI series against South Africa. He contributed to India's 3–2 series win with 208 runs at an average of 41.60 which included 2 fifties and three wickets at an average of 22.66 topping the bowling average chart for the series. His career best bowling figure of 2/43 from nine overs in the First ODI at Kochi, was also the best bowling figure by any bowler in that particular match. India next played a tri-nation series in Sharjah but failed to qualify for the Finals. Such was the collective failure of Indian batting, that Dravid, with a mediocre returns of 89 runs from 4 matches at an average of 22.25, was still the 2nd best Indian batsman in the series. In February 2000, Tendulkar tendered his resignation from captaincy amidst much speculations resulting in the promotion of Ganguly, the vice-captain then, as the new captain of the Indian team. In May 2000, while Dravid was busy playing county cricket in England, Indian team was announced for the Asia cup and he was handed the vice-captaincy of the team. The newly appointed vice-captain had to leave the county championship temporarily, missing two championship games and two one day games, to fulfill his national commitment. Indian team, Dravid included, fared poorly in the Asia cup and failed to qualify for the Final. Subsequently, Dravid returned to England to resume his county sojourn with Kent. As the new international season commenced, the first and foremost challenge for the newly appointed captain and vice-captain, Ganguly and Dravid respectively, was to pull the team out of the shadows of the match fixing scandal. Indian team played 2000 ICC KnockOut Trophy with vigour and showed a lot of character beating Kenya, Australia and South Africa in consecutive matches to reach the Finals. Although India lost to New Zealand in the Finals, their spirited performance in the tournament helped restoring public faith back in Indian cricket. Dravid played his part scoring 157 runs in 4 matches at an average of 52.33, including 2 fifties. Dravid scored 85 runs in the second match of 2000–01 Coca-Cola Champions Trophy against Zimbabwe while opening the innings but was forced to miss the rest of the tournament because of an injury. India went on to reach the Final where they got bowled out for a paltry score of 54 losing to Sri Lanka by 245 runs. India kick started the new Test season with a 9-wicket win against Bangladesh. Dravid played a brisk knock of 41 runs from 49 balls, including 5 fours and a six, while chasing a target of 63 runs. Dravid's next assignment was a test series against Zimbabwe which was John Wright's first series as Indian coach. Dravid had recommended Wright's name as the new national team coach having had the first hand experience of Wright's coaching skills during his county stint. The Indian vice-captain welcomed the new coach with his maiden double hundred. He scored 200 not out in the first inning and 70 not out in the second, guiding India to a comfortable 9-wicket victory against Zimbabwe. He scored 162 in the drawn Second test to end the series with an average of 432.00 – highest batting average by an Indian in a Test series. Dravid had a modest outing with the bat against Zimbabwe in the bilateral ODI series. He captained the Indian team for the first time in the fifth match of the series in the absence of the regular captain Ganguly who was serving one match suspension. Riding on Agarkar's all-round performance, Dravid led India to a 39-run victory in his maiden ODI as Indian captain. The Australian team toured India in February 2001 for what was being billed as the "Final Frontier" for Steve Waugh's all conquering men, who were coming on the back of 15 consecutive Test wins. Dravid failed in the first innings of the First Test but displayed strong resilience in Tendulkar's company in the second innings. Dravid's 196 ball long resistance finally ended when he got out bowled to Warne for 39 runs. Despite their efforts, they could not stop the Australians from extending their winning streak to 16 consecutive Test wins as they beat India convincingly by 10 wickets inside three days. The Australian juggernaut seemed unstoppable as they looked on course for their 17th consecutive victory in the Second Test at the Eden Gardens, when they bowled India out for meagre 171 in the first innings and enforced a follow-on after securing a massive lead of 274 runs. In the second innings, Laxman, who had scored a fine fifty in the first innings, was promoted to no. 3 position which had been Dravid's usual spot for quite sometime now, while Dravid, who had gotten out bowled to Warne for second time in a row in the first innings for just 25 runs, was relegated to no. 6 position. When Dravid joined Laxman in the middle on the third day of the Test, with scoreboard reading 232/4 and India still needing 42 runs to avoid an innings defeat, another convincing win for Australia looked inevitable. However, what transpired etched the names of Laxman and Dravid as the architects of one the greatest fightbacks in the cricketing history. Dravid and Laxman played the remaining time on the third day and whole of the fourth day, denying Australia a single wicket on Day 4. Steve Waugh used nine different bowlers but could not break the Laxman-Dravid partnership who completely dominated the Australian bowlers adding 335 runs on Day 4. Dravid, who was disappointed, both with the severe criticism for his own recent failures in the series as well as the flak received by the team in the media, celebrated his hundred in an uncharacteristic fashion gesturing at the press box. Eventually, Laxman got out on the fifth morning bringing the 376-runs partnership to an end. Dravid soon perished getting run out for 180 while trying to force the pace. Captain Ganguly declared the innings at 657/7 setting Australia a target of 384 runs with 75 overs left in the match. An inspired team India bowled superbly to dismiss Australia for 212 in 68.3 overs. India won the match by 171 runs. This was only the third instance of a team winning a Test after following-on and India became the 2nd team to do so. Dravid scored 81 runs in the first innings of the Third Test and took 4 catches in the match as India defeated Australia at Chennai in a nail biting finish to clinch the series 2–1. Dravid scored 80 in the first of the 5-match ODI series at his home ground as India won the match by 60 runs. He didn't do too well in the remaining 4 ODIs as Australia won the series 3–2. Dravid topped the averages for the 2000/01 Test season with 839 runs from six matches at an average of 104.87. Dravid had a decent outing in Zimbabwe, scoring 137 runs from 134 balls in the First Tour game and aggregating 138 runs at an average of 69.00 from the drawn Test series. In the ensuing triangular ODI series, he aggregated 121 runs from 5 matches at an average of 40.33 and a strike rate of 101.68, the highlight being an unbeaten 72 off 64 balls, while chasing a target of 235 against Zimbabwe in the 3rd match of the series, guiding India to a 4-wicket win with four balls to spare. He was adjudged man of the match for his match winning knock. On the next tour to Sri Lanka, India lost the first three matches of the triangular event. In the absence of suspended Ganguly, Dravid captained the side in the 4th match and led them to their first win in the series. India won the next two matches to qualify for the Final, which they went on to lose to Sri Lanka. Dravid played crucial innings in all the three victories including a fifty in the last match. He top scored for India in the series with 259 runs from seven matches at an average of 51.80 and a strike rate of 59.81. Dravid, who had been relegated to no. 6 position during the Test series against Australia few months back, regained his usual no. 3 spot during the ensuing 3-Test series in Sri Lanka, in the absence of Laxman. Batting at no. 3, Dravid scored a crucial 75 in the tough fourth innings chase of the Second Test. The young leaders of the team, Ganguly and Dravid, ensured India's first Test win in Sri Lanka since 1993, through some stunning display of batting in the fourth innings of the Second Test, despite the absence of key players like Tendulkar, Laxman, Srinath and Kumble. However, India lost the First and the Third Test to lose the series 1–2. Dravid top scored for India in the series with 235 runs at an average of 47.00. Dravid had decent success in Standard Bank tri-series on South Africa tour, scoring 214 runs (including 3 fifties) at an average of 53.50 and a strike rate of 71.81. He also kept wickets in the final two ODIs of the series effecting 3 stumpings. Dravid opened the innings in the first test of the ensuing Test series but failed to make a mark as India lost the match. India, having failed to last hundred overs in any of the previous three innings in the series, needed to bat out four sessions in the Second Test to save the match. They started on a poor note losing their first wicket in the first over with zero runs on the scoreboard. However, Dravid forged an important partnership of 171 runs with Dasgupta. More importantly, the partnership lasted for 83.2 overs taking India to the brink of safety. Poor weather too helped India salvage a draw as only 96.2 overs could be bowled in the innings. Dravid captained the team in the 'unofficial' Third test in the absence of injured Ganguly, which India lost by an innings margin. By the end of the South African tour, Dravid had started experiencing problem in his right shoulder. Although he played the ensuing home test series against England, he pulled out of the six-match bilateral ODI series to undergo shoulder rehabilitation program in South Africa. He returned for the Zimbabwe's tour of India but performed below par, scoring a fifty each in the Test series and the bilateral ODI series. Overall, Dravid had a disappointing 2001/02 season, scoring 296 runs from seven Tests at an average of 29.60. However, Dravid struck form in the ensuing season. For the next four years, Dravid outclassed every Indian batsman by a mile to establish himself as India's most prolific run-machine. During this four-year period, Dravid was the top scorer for India in both the formats of the game. Between 2002-06, Dravid scored 4,697 runs for India in 48 Tests at an average of 70.10, almost 18 runs more than the next best batsman, Virender Sehwag, who averaged 52.48 in the same period. He scored fourteen hundreds during the period, including four double hundreds. India's next international assignment was the England tour in June 2002, six years after the previous tour when Dravid had made his Test debut. It was on this tour where Dravid hit the peak form of his career. The tour started with a triangular ODI series involving India, England and Sri Lanka. Dravid continued his keeping job in the series. In the first ODI at Lord's, he effected three dismissals (two catches and a stumping) and then scored an unbeaten 73 guiding India to a six-wicket victory against England in the company of Yuvraj Singh. In the 4th ODI against Sri Lanka, he scored a fifty that won him a man of the match award as India won the match by 4 wickets. India eventually pulled off a remarkable chase to win the tournament beating England in the final by two wickets. Dravid's aggregated 245 runs in the tournament at an average of 49. Dravid warmed up for the four-match Test series with a fifty against Hampshire in the tour game. He scored 46 and 63 in the First Test at Lord's as India lost the match by 170 runs. He failed in the first innings of the Second Test at Nottingham as India scored 357 runs. England, riding on Vaughn's hundred, piled up a mammoth 617 runs, taking a first innings lead of 260 runs. Indian team was in a state of bother as they were reduced to 11/2 in the second innings, still trailing by 249 runs however, a match saving hundred by Dravid along with the fifties from Tendulkar and Ganguly enabled India to draw the match. The Third Test was played at Headingley, traditionally known to be conducive for seam bowling. Ganguly won the toss and took a bold decision to bat first on a gloomy overcast morning. Nasser Hussain had studded his bowling line-up with four seamers including Hoggard, Flintoff, Tudor and Caddick. To make the matters worse, India lost Sehwag in the seventh over of the match. However, Dravid came in and joined forces with Bangar. Together the two batsmen weathered the storm. They applied themselves, took body blows but never gave the English bowlers any chance. Dravid and Bangar starred in a match defining partnership of 170 runs. By the time Bangar got out after a commendable fifty, the sun was out and batting had become easier. Tendulkar joined Dravid as Dravid went on to complete his 12th Test hundred. Dravid and Tendulkar put on 150 runs together before a battered and bruised Dravid finally got out stumped to Giles for 148 runs, but not before playing out the difficult morning session of the second day. As the conditions got easier to bat, Ganguly and Tendulkar piled on England's misery bringing up their individual hundreds in the process. India declared the innings on 628/8 and then bowled England out twice to win the match by an innings and 46 runs – India's first overseas victory by an innings margin since 1977/78. Such was the impact of Dravid's seven-hour-long fighting knock that, despite Sachin outscoring him by 45 runs (he scored 193 runs), Dravid was adjudged the man of the match for his 148 runs. Dravid backed up his two consecutive hundreds in the series with another one at The Oval, this time scoring a double hundred. After England scored 515 runs in the first innings of the fourth Test, Dravid scored 217 runs to take India to 505. The test and the series ended in a draw. Dravid was adjudged man of the match for second consecutive match. Dravid amassed 602 runs in the series at an average of 100.33, including three hundreds and a fifty and was adjudged joint man of the series along with Vaughan. Dravid fielding during a Test match against Sri Lanka in Galle in 2008. Dravid had always been keen on further honing his batting skills in testing English conditions by playing in county cricket. He had discussed about the prospects regarding the same with John Wright, the former New Zealand cricketer and incumbent Kent coach, during India's 1998–99 tour of New Zealand. Wright was particularly impressed with Dravid's performance on that tour, especially his twin hundreds at Hamilton. The talks finally materialized and Dravid made his county debut for Kent in April 2000. His co-debutante Ganguly made his county debuted in the same match, albeit for the opposite team. Kent offer had come as a welcome change for Dravid. There was too much negativity surrounding Indian cricket marred by match fixing controversy. Dravid himself had been struggling to score runs in Tests for quite some time now. The county stint gave him a chance to "get away to a new environment" and "relax". The wide variety of pitches and weather conditions in England and a full season of intense county cricket against professional cricketers gave him a chance to further his cricketing education and learn things about his game. An innings-by-innings breakdown of Dravid's Test match batting career, showing runs scored (red bars with purple bars for not out) and the average of the last ten innings (blue line). He was named one of the Wisden cricketers of the year in 2000. Though primarily a defensive batsman, Dravid scored 50 runs not out in 22 balls (a strike rate of 227.27) against New Zealand in Hyderabad on 15 November 2003, the second fastest 50 among Indian batsmen. Only Ajit Agarkar's 67 runs off 21 balls is faster than that of Dravid. After reaching 10,000 test runs milestone, he said, "It's a proud moment for sure. For me, growing up, I dreamt of playing for India. When I look back, I probably exceeded my expectations with what I have done over the last 10 to 12 years. I never had an ambition to do it because I never believed – it is just a reflection of my longevity in the game." One of Dravid's most debated decisions was taken in March 2004, when he was standing in as the captain for injured Sourav Ganguly. India's first innings was declared at a point when Sachin Tendulkar was at 194 runs not out with 16 overs remaining on Day 2. In this test match Sehwag scored triple century first time. He became the first Indian to score triple century in test with a score of 309. 2000 - Dravid was one of the five cricketers selected as Wisden Cricketer of the Year. Rahul Dravid has been sponsored by several brands throughout his career including Reebok (1996 – present), Pepsi (1997 present), Kissan (Unknown), Castrol (2001 – present), Hutch (2003), Karnataka Tourism (2004), Max Life (2005 – present), Bank of Baroda (2005 – present), Citizen (2006 – present), Skyline Construction (2006 – present), Sansui (2007), Gillette (2007 – present), Samsung (2002 – 2004), World Trade Center Noida (2013– present),. ^ Jammy: Advertisers' Mr Dependable. The Hindu Businessline. Retrieved 10 March 2010. ^ "Is Rahul Dravid the greatest middle-order batsman of all time?". bbc.co.uk. 9 March 2012. Archived from the original on 11 March 2012. ^ "The greatness of Rahul Dravid". bbc.co.uk. 9 March 2012. Archived from the original on 11 June 2012. ^ "'The best No. 3 batsman in the world'". rediff.com. 28 March 2012. Archived from the original on 24 December 2013. ^ "Cricketer of the Year, 2000 – Rahul Dravid". Content.cricinfo.com. Retrieved 20 December 2010. ^ "ICC Awards: Look no further Dravid". Espnstar.com. 5 September 2008. Archived from the original on 21 July 2011. Retrieved 20 December 2010. ^ "Dravid, gentleman and thinking cricketer: Report". The Economic Times. PTI. 10 March 2012. Retrieved 3 October 2012. ^ "Superb in overseas conditions". Archived from the original on 27 November 2011. Retrieved 25 November 2011. ^ "Test matches / Batting records". ESPNcricinfo. Archived from the original on 28 February 2014. Retrieved 23 July 2012. ^ "They came, they played, they conquered". Archived from the original on 25 April 2009. Retrieved 11 May 2009. ^ "Indian Dravid claims Test catch record". CNN. 6 April 2009. Archived from the original on 26 March 2010. Retrieved 20 December 2010. ^ "This day that year: Rahul Dravid faced his first ball in Test on June 22, 1996". India Today. Retrieved 3 July 2017. ^ "Rahul Dravid announces retirement from international cricket". Times of India. Archived from the original on 9 March 2012. Retrieved 9 March 2012. ^ "Bradman Awards honour for Dravid, McGrath". Wisden India. Archived from the original on 5 November 2012. Retrieved 1 November 2012. ^ "Padma Vibhushan for Yash Pal, Roddam, S.H. Raza, Mohapatra". The Hindu. Archived from the original on 24 December 2013. Retrieved 26 January 2013. ^ "Rahul Dravid to mentor India's potential Olympians – Latest News & Updates at Daily News & Analysis". 27 January 2014. Archived from the original on 6 February 2014. ^ "Ponting, Dravid, Claire Taylor inducted into ICC Hall of Fame". ESPNcricinfo. 2 July 2018. ^ "Meet Rahul Sharad Dravid". Times of India. Retrieved 24 February 2007. ^ "Meet Rahul Dravid". The Times of India. 24 February 2007. Retrieved 27 March 2007. ^ "Cricinfo – Players and Officials – Rahul Dravid". Archived from the original on 27 April 2007. Retrieved 6 May 2007. ^ "The Hindu : Keeping the windows". ^ "People | The Great Wall of India". Verveonline.com. Archived from the original on 16 July 2011. Retrieved 20 December 2010. ^ a b c "Dravid's personal choices". Dravidthewall. Archived from the original on 23 October 2013. Retrieved 22 October 2013. ^ "Ravichandran Ashwin, Rahul Dravid among most educated Indian cricketers". India Today. Retrieved 1 December 2015. ^ "webindia123-Indian personalities-sports-RAHUL DRAVID". Archived from the original on 10 August 2007. Retrieved 6 May 2007. ^ "Cricinfo – Coach Keki Tarapore reflects on pupil Rahul Dravid". Retrieved 6 May 2007. ^ "Rahul Dravid". Triposo. Archived from the original on 22 October 2013. Retrieved 22 October 2013. ^ "Rahul Dravid Ranji debut". 40to40. Archived from the original on 23 October 2013. Retrieved 22 October 2013. ^ "Maharashtra v Karnataka at Pune, 02-05 Feb 1991". Retrieved 6 May 2007. ^ a b Jaishankar, Vedam (19 January 1997). "Dravid: taming the Goliaths of pace". The Indian Express. Archived from the original on 22 April 1997. Retrieved 18 October 2018. ^ "Batting – Most Runs (Ranji trophy 1991–92)". Retrieved 6 May 2007. ^ "South Zone squad 1991–92". Retrieved 6 May 2007. ^ Prabhudesai, Devendra (December 2005). "Taking Guard". The Nice Guy Who Finished First: A Biography Of Rahul Dravid. New Delhi, Ind: Rupa Publications. p. 5. ISBN 978-81-291-16505. ^ Somani, Saurabh (22 May 2012). "Stranger, Legend, Martyr – Champion". WisdenIndia. Archived from the original on 14 January 2017. Retrieved 20 August 2017. ^ a b c d e Somani, Saurabh (16 September 2011). "The Rahul Dravid journey in ODIs". Cricbuzz. Archived from the original on 20 August 2017. Retrieved 20 August 2017. ^ a b "Timeline: Rahul Dravid". ESPNcricinfo. Archived from the original on 14 August 2015. Retrieved 23 August 2015. ^ "Rahul Dravid Profile@Firstpost". Firstpost. Archived from the original on 17 January 2012. Retrieved 16 August 2017. ^ a b c d e f g h i j k l m n o p q r s t u v "Player Oracle: Rahul Dravid". CricketArchive. Archived from the original on 23 August 2015. Retrieved 23 August 2015. ^ Guyer, Julian (20 July 2011). "Lord's feels like home, says Dravid". Cricketcountry. Archived from the original on 18 August 2015. Retrieved 19 August 2015. ^ Prabhudesai, Devendra (December 2005). "Taking Guard". The Nice Guy Who Finished First: A Biography Of Rahul Dravid. New Delhi, Ind: Rupa Publications. pp. 2–8. ISBN 978-81-291-16505. ^ Prabhudesai, Devendra (December 2005). The Nice Guy Who Finished First: A Biography Of Rahul Dravid. New Delhi, Ind: Rupa Publications. pp. 13–17. ISBN 978-81-291-16505. ^ Prabhudesai, Devendra (December 2005). "Hero at Headquarters". The Nice Guy Who Finished First: A Biography Of Rahul Dravid. New Delhi, Ind: Rupa Publications. p. 18. ISBN 978-81-291-16505. ^ a b c d "Dravid's Test career: Innings by innings list". ESPNcricinfo. Archived from the original on 23 August 2015. Retrieved 23 August 2015. ^ Sethuraman, Gautham (20 June 2013). "Golden debuts on this day: Sourav Ganguly and Rahul Dravid at Lord's". Khelnama. Archived from the original on 22 August 2015. Retrieved 22 August 2015. ^ Prabhudesai, Devendra (December 2005). "Hero at Headquarters". The Nice Guy Who Finished First: A Biography Of Rahul Dravid. New Delhi, Ind: Rupa Publications. pp. 20–22. ISBN 978-81-291-16505. ^ "Test fielding innings list: Rahul Dravid". ESPNcricinfo. Archived from the original on 23 August 2015. Retrieved 23 August 2015. ^ "Scorecard: India tour of England, 1996 – 2nd Test". ESPNcricinfo. Archived from the original on 23 August 2015. Retrieved 23 August 2015. ^ Prabhudesai, Devendra (December 2005). "Hero at Headquarters". The Nice Guy Who Finished First: A Biography Of Rahul Dravid. New Delhi, Ind: Rupa Publications. p. 26. ISBN 978-81-291-16505. ^ Gollapudi, Nagraj (19 July 2011). "Dravid returns to where it all began". ESPNcricinfo. Archived from the original on 27 August 2015. Retrieved 27 August 2015. ^ a b c Gollapudi, Nagraj (15 September 2011). "Just another day in Dravid's life". ESPNcricinfo. Archived from the original on 7 April 2016. Retrieved 10 January 2017. ^ S Rajesh. "An unlikely star of the 50-over format". ESPNcricinfo. Retrieved 16 September 2011. ^ "Most runs: South Africa in India Test series, 1996/97". ESPNcricinfo. Archived from the original on 26 March 2014. Retrieved 17 August 2016. ^ "Match report: India tour of South Africa 1996/97, First Test". ESPNcricinfo. Archived from the original on 5 January 2016. Retrieved 19 August 2016. ^ "Scorecard: India tour of South Africa 1996/97, First Test". ESPNcricinfo. Archived from the original on 8 March 2016. Retrieved 19 August 2016. ^ "'Adaptability is his greatest talent' - Dravid". ESPNcricinfo. Retrieved 10 December 2005. ^ "Rewind 1996: the debuts to remember". News18. Retrieved 18 July 2011. ^ "Javagal Srinath's 6 for 21 triggers Indian victory against South Africa at Ahmedabad". Cricket County. Retrieved 22 November 2017. ^ "Match Report: India tour of South Africa, 1996/97, Third Test". ESPNcricinfo. Archived from the original on 5 January 2016. Retrieved 19 August 2016. ^ "Match awards in Tests for Rahul Dravid". ESPNcricinfo. Archived from the original on 17 October 2015. Retrieved 19 August 2016. ^ "Most runs: India in South Africa Test series, 1996/97". ESPNcricinfo. Archived from the original on 5 January 2016. Retrieved 12 January 2017. ^ "Results: India in West Indies, Test series, 1996/97". ESPNcricinfo. Archived from the original on 26 January 2016. Retrieved 21 August 2016. ^ "Most runs: India in West Indies, Test series, 1996/97". ESPNcricinfo. Archived from the original on 17 October 2015. Retrieved 21 August 2016. ^ "Scorecard: India tour of West Indies, 1996/97, Fifth Test". ESPNcricinfo. Archived from the original on 8 March 2016. Retrieved 21 August 2016. ^ "Most runs: 1996/97 Test season". ESPNcricinfo. Archived from the original on 5 January 2016. Retrieved 21 August 2016. ^ "Most fifties in consecutive Test innings". ESPNcricinfo. Archived from the original on 31 October 2015. Retrieved 31 October 2015. ^ "Dravid in Tests till 1997/98 Test season". ESPNcricinfo. Archived from the original on 31 October 2015. Retrieved 31 October 2015. ^ "Indian batting in 1998/99 Test season". ESPNcricinfo. Archived from the original on 24 August 2016. Retrieved 24 August 2016. ^ "Scorecard: India in Zimbabwe, 1998/99, Only Test". ESPNcricinfo. Archived from the original on 5 May 2016. Retrieved 23 August 2016. ^ "Scorecard: India in New Zealand, 1998/99, First Test". ESPNcricinfo. Archived from the original on 23 April 2016. Retrieved 24 August 2016. ^ "Match Report: India in New Zealand, 1998/99, Third Test". ESPNcricinfo. Archived from the original on 5 March 2016. Retrieved 24 August 2016. ^ "Most runs: India in New Zealand, Test series, 1998/99". ESPNcricinfo. Archived from the original on 1 August 2017. Retrieved 19 August 2017. ^ "Results: India in New Zealand, 1998/99". ESPNcricinfo. Archived from the original on 1 August 2017. Retrieved 19 August 2017. ^ "Scorecard: Pakistan in India, 1998/99, First Test". ESPNcricinfo. Archived from the original on 7 March 2016. Retrieved 25 August 2016. ^ "Scorecard: Pakistan in India, 1998/99, Second Test". ESPNcricinfo. Archived from the original on 2 May 2016. Retrieved 25 August 2016. ^ "Match Report: Asian Test Championship 1998/99, First Test, Ind vs Pak". ESPNcricinfo. Archived from the original on 7 May 2016. Retrieved 30 August 2016. ^ Sa'adi Thawfeeq. "Match report: Asian Test Championship 1998/99, Second Test, SL vs Ind". ESPNcricinfo. Archived from the original on 4 March 2016. Retrieved 30 August 2016. ^ S Jagadish; Rick Eyre. "Match Report: Asian Test Championship 1998/99, Second Test, SL vs Ind". ESPNcricinfo. Archived from the original on 4 March 2016. ^ "Results: Asian Test Championship 1998/99". ESPNcricinfo. Archived from the original on 12 March 2016. Retrieved 30 August 2016. ^ a b Gupta, Rajneesh (17 October 2007). "When poor form ruled Dravid out". Rediff.com. Archived from the original on 22 April 2008. Retrieved 10 January 2017. ^ a b S Rajesh (16 September 2011). "An unlikely star of the 50-over format". ESPNcricinfo. Archived from the original on 5 January 2016. Retrieved 11 January 2017. ^ "Top scorers: Sahara 'Friendship' Cup 1996". ESPNcricinfo. Archived from the original on 5 January 2016. Retrieved 11 January 2017. ^ a b c "Dravid's match/series awards in ODIs". Howstat. Archived from the original on 29 August 2016. Retrieved 11 January 2017. ^ "Most runs: Standard Bank International One Day series, 1996/97". ESPNcricinfo. Archived from the original on 5 January 2016. Retrieved 12 January 2017. ^ "Scorecard: Final, Standard Bank International One Day series, 1996/97". ESPNcricinfo. Archived from the original on 17 April 2016. Retrieved 12 January 2017. ^ "Most runs: India in West Indies ODI series, 1996/97". ESPNcricinfo. Archived from the original on 5 January 2016. Retrieved 13 January 2017. ^ "Match report: 6th match, Pepsi Independence Cup 1997, IND vs PAK". ESPNcricinfo. Archived from the original on 24 February 2016. Retrieved 13 January 2017. ^ "Scorecard: 6th match, Pepsi Independence Cup 1997, IND vs PAK". ESPNcricinfo. Archived from the original on 7 September 2016. Retrieved 13 January 2017. ^ "Most runs: Pepsi Independence Cup 1997". ESPNcricinfo. Archived from the original on 1 November 2014. Retrieved 13 January 2017. ^ "Result summary: Pepsi Independence Cup 1997". ESPNcricinfo. Archived from the original on 24 November 2016. Retrieved 13 January 2017. ^ "Dravid's ODI career: Series averages". ESPNcricinfo. Archived from the original on 20 August 2017. Retrieved 20 August 2017. ^ "Dravid in ODIs: Debut-1998". ESPNcricinfo. Archived from the original on 26 March 2014. Retrieved 15 January 2017. ^ Shridhar Sawadatti. [https:www.sportskeeda.com/amp/cricket/the-wall-that-stood-tall-in-all-the-conditions-rahul-dravid-india/3 "Rahul Dravid: The Wall that stood tall in all conditions"]. Sports Keeda. ^ "Scorecard: 1st match, India in New Zealand ODI series, 1998/99". ESPNcricinfo. Archived from the original on 5 January 2016. Retrieved 17 January 2017. ^ "Scorecard: 4th match, India in New Zealand ODI series, 1998/99". ESPNcricinfo. Archived from the original on 20 December 2016. Retrieved 17 January 2017. ^ "Most runs: India in New Zealand ODI series, 1998/99". ESPNcricinfo. Archived from the original on 5 January 2016. Retrieved 17 January 2017. ^ "Match report: 2nd match, Pepsi Cup 1998/99, Ind vs SL". ESPNcricinfo. Archived from the original on 19 July 2015. Retrieved 18 January 2017. ^ "Scorecard: 3rd match, Pepsi Cup 1998/99, Ind vs Pak". ESPNcricinfo. Archived from the original on 22 August 2017. Retrieved 22 August 2017. ^ a b c "Dravid's ODI career: Innings by innings list". ESPNcricinfo. Archived from the original on 5 January 2016. Retrieved 10 January 2017. ^ "Dravid's ODI fielding analysis: Innings by innings list". ESPNcricinfo. Archived from the original on 19 January 2017. Retrieved 19 January 2017. ^ "Match report: 3rd match, Coca-cola Cup 1998/99, Eng vs Ind". ESPNcricinfo. Archived from the original on 16 August 2015. Retrieved 19 January 2017. ^ "Scorecard: 3rd match, Coca-Cola Cup 1998/99, Eng vs Ind". ESPNcricinfo. Archived from the original on 22 August 2017. Retrieved 22 August 2017. ^ "Most runs: Coca-Cola Cup 1998/99". ESPNcricinfo. Archived from the original on 22 November 2016. Retrieved 19 January 2017. ^ "Scorecard: Good Luck India Match (Ind 1983 vs Ind 1999)". CricketArchive. Archived from the original on 12 February 2012. Retrieved 21 January 2017. ^ a b "Dravid's performance in ICC World Cup 1999". ESPNcricinfo. Archived from the original on 21 January 2017. Retrieved 21 January 2017. ^ "Result summary: ICC World Cup 1999". ESPNcricinfo. Archived from the original on 24 November 2016. Retrieved 21 January 2017. ^ "Indians throw thriller away". BBC News. Archived from the original on 21 January 2017. Retrieved 21 January 2017. ^ "Match report: 9th Group A match, ICC World Cup 1999, Ind vs Ken". ESPNcricinfo. Archived from the original on 5 January 2016. Retrieved 22 January 2017. ^ "Scorecard: 15th match, ICC World Cup 1999, Ind vs Ken". ESPNcricinfo. Archived from the original on 8 August 2017. Retrieved 1 September 2017. ^ a b c "Dravid's appearances as designated keeper in ODIs". ESPNcricinfo. Archived from the original on 22 January 2017. Retrieved 22 January 2017. ^ a b "Indian record-breakers crush holders". BBC News. Archived from the original on 6 March 2016. Retrieved 22 January 2017. ^ "Dravid & Ganguly partner to World Cup best in '99". icc-cricket.com. Archived from the original on 4 January 2015. Retrieved 22 January 2017. ^ "England crash out". BBC News. Archived from the original on 22 January 2017. Retrieved 22 January 2017. ^ "India triumph in Pakistan Cup clash". BBC News. Archived from the original on 22 January 2017. Retrieved 22 January 2017. ^ "Kiwis charge into semi-finals". BBC News. Archived from the original on 28 January 2017. Retrieved 28 January 2017. ^ "Most runs: ICC World Cup, 1999". ESPNcricinfo. Archived from the original on 22 November 2016. Retrieved 22 January 2017. ^ Prabhudesai, Devendra (December 2005). "On The Roller-Coaster". The Nice Guy Who Finished First: A Biography of Rahul Dravid. New Delhi, Ind: Rupa Publications. p. 73. ISBN 978-81-291-16505. ^ "Most runs: Coca-Cola Singapore Challenge, 1999". ESPNcricinfo. Archived from the original on 6 October 2013. Retrieved 23 January 2017. ^ "Scorecard: Final, Coca-Cola Singapore Challenge 1999, Ind vs WI". ESPNcricinfo. Archived from the original on 16 December 2016. Retrieved 23 January 2017. ^ "Most runs: DMC Cup, 1999". ESPNcricinfo. Archived from the original on 23 January 2017. Retrieved 23 January 2017. ^ Siddiqui, Latafat Ali. "India defeat West Indies to win series". ESPNcricinfo. Archived from the original on 8 April 2016. Retrieved 23 January 2017. ^ "Match report: 1st Test, New Zeland in India Test series, 1999/00". ESPNcricinfo. Archived from the original on 12 March 2015. Retrieved 23 January 2017. ^ "Match report: 5th match, New Zealand in India ODI series, 1999/00". ESPNcricinfo. Archived from the original on 3 February 2016. Retrieved 24 January 2017. ^ "Most runs: New Zealand in India ODI series, 1999/00". ESPNcricinfo. Archived from the original on 24 January 2017. Retrieved 24 January 2017. ^ a b "Highest partnerships for any wicket in ODIs". ESPNcricinfo. Archived from the original on 9 November 2016. Retrieved 24 January 2017. ^ "Dravid in ODIs in the year 1999". ESPNcricinfo. Archived from the original on 24 January 2017. Retrieved 24 January 2017. ^ "Result Summary: India tour of Australia, 1999/00". ESPNcricinfo. Archived from the original on 5 January 2016. Retrieved 24 January 2017. ^ "Bowling statistics: South Africa in India, ODI series, 1999/00". ESPNcricinfo. Archived from the original on 24 October 2017. Retrieved 11 September 2018. ^ "Scorecard: South Africa in India, 1999/00, First ODI". ESPNcricinfo. 9 March 2000. Archived from the original on 29 August 2018. Retrieved 11 September 2018. ^ "Results: Coca-cola Cup, 1999/00". ESPNcricinfo. Archived from the original on 18 February 2018. Retrieved 11 September 2018. ^ "Most runs: Coca-cola Cup, 1999/00". ESPNcricinfo. Retrieved 11 September 2018. ^ Vasu, Anand (20 February 2000). "Tendulkar to step down, mystery shrouds decision". ESPNcricinfo. Archived from the original on 10 September 2018. Retrieved 11 September 2018. ^ Ramchand, Partab (26 February 2000). "Ganguly captain for one dayers, Indian team for second Test". ESPNcricinfo. Archived from the original on 3 August 2017. Retrieved 11 September 2018. ^ Weaver, Paul (24 May 2000). "Kent cry foul as Dravid leads Indian exodus". The Guardian. Archived from the original on 9 May 2014. Retrieved 11 September 2018. ^ a b c Prabhudesai, Devendra (December 2005). "Kent, And The Coliseum". The Nice Guy Who Finished First: A Biography Of Rahul Dravid. New Delhi, Ind: Rupa Publications. pp. 81–84. ISBN 978-81-291-16505. ^ a b c Prabhudesai, Devendra (December 2005). "Kent, And The Coliseum". The Nice Guy Who Finished First: A Biography Of Rahul Dravid. New Delhi, Ind: Rupa Publications. pp. 84–88. ISBN 978-81-291-16505. ^ "Most runs: ICC Knockout Tournament, 2000/01". ESPNcricinfo. Archived from the original on 13 June 2018. Retrieved 12 September 2018. ^ "Scorecard: Only Test, India in Bangladesh, 2000/01". ESPNcricinfo. Retrieved 12 September 2018. ^ Mustafi, Suvajit (6 March 2018). "Sourav Ganguly credits Rahul Dravid for John Wright's appointment as India's coach". CricketCountry. Archived from the original on 10 March 2018. Retrieved 12 September 2018. ^ Verma, Devarchit (15 July 2014). "Naman Ojha narrowly misses out on beating Rahul Dravid's feat during India A's tour of Australia 2014". CricketCountry. Archived from the original on 19 April 2015. Retrieved 12 September 2018. ^ Mittra, Sakyasen (13 December 2000). "Bengal players rush to Ganguly's defence". ESPNcricinfo. Archived from the original on 22 October 2017. Retrieved 12 September 2018. ^ "Scorecard: 5th ODI, Zimbabwe in India, 2000/01". ESPNcricinfo. 14 December 2000. Retrieved 12 September 2018. ^ a b c d e Prabhudesai, Devendra (December 2005). "Kent, And The Coliseum". The Nice Guy Who Finished First: A Biography Of Rahul Dravid. New Delhi, Ind: Rupa Publications. pp. 90–96. ISBN 978-81-291-16505. ^ Sethuraman, Mahesh (27 February 2013). "Mumbai '01 - An underrated classic". ESPNcricinfo. Archived from the original on 14 September 2018. Retrieved 14 September 2018. ^ "Scorecard: First Test, Australia in India, 2000/01". ESPNcricinfo. Archived from the original on 7 July 2018. Retrieved 14 September 2018. ^ Burnett, Adam (29 May 2018). "The Best Of VVS Laxman". Archived from the original on 29 July 2018. Retrieved 14 September 2018. ^ "No wickets in a full day's play". ESPNcricinfo. Archived from the original on 3 February 2018. Retrieved 14 September 2018. ^ a b "We took it session by session, say the day's heroes". ESPNcricinfo. 14 March 2001. Archived from the original on 12 December 2011. Retrieved 14 September 2018. ^ a b Chughtai, Arshad (18 March 2001). "Forced to follow-on yet won". ESPNcricinfo. Archived from the original on 4 February 2018. Retrieved 14 September 2018. ^ Bhattacharya, Rahul (30 August 2018). "India beating Australia in Kolkata". ESPNcricinfo. Archived from the original on 14 September 2018. Retrieved 14 September 2018. ^ "Scorecard: Second Test, Australia in India, 2000/01". ESPNcricinfo. Archived from the original on 30 August 2018. Retrieved 14 September 2018. ^ "Results summary: Australia in India, 2000/01". ESPNcricinfo. Archived from the original on 14 September 2018. Retrieved 14 September 2018. ^ "Batting averages: 2000/01 Test season". ESPNcricinfo. Retrieved 14 September 2018. ^ "Scorecard: First Tour game, India in Zimbabwe, 2001". ESPNcricinfo. Archived from the original on 14 September 2018. Retrieved 14 September 2018. ^ "Most runs: India in Zimbabwe, Test series, 2001". ESPNcricinfo. Archived from the original on 21 January 2018. Retrieved 14 September 2018. ^ "Most runs: Coca-cola Cup, India in Zimbabwe, 2001". ESPNcricinfo. Archived from the original on 21 January 2018. Retrieved 14 September 2018. ^ "Scorecard: 3rd match, Zim vs Ind, Coca-Cola Cup, 2001". ESPNcricinfo. Archived from the original on 14 September 2018. Retrieved 14 September 2018. ^ a b c Prabhudesai, Devendra (December 2005). "One For A Crisis". The Nice Guy Who Finished First: A Biography Of Rahul Dravid. New Delhi, Ind: Rupa Publications. pp. 98–102. ISBN 978-81-291-16505. ^ "Most runs: Coca-Cola Cup (in Sri Lanka), 2001". ESPNcricinfo. Retrieved 14 September 2018. ^ Ugra, Sharda (10 September 2001). "Unlikely friendship between Sourav Ganguly, Rahul Dravid holds key to Team India's future". India Today. Archived from the original on 14 September 2018. Retrieved 14 September 2018. ^ "Most runs: Test series, India in Sri Lanka, 2001". ESPNcricinfo. Archived from the original on 5 January 2018. Retrieved 14 September 2018. ^ "Most runs: Standard Bank Triangular Tournament, 2001/02". ESPNcricinfo. Archived from the original on 19 February 2018. Retrieved 15 September 2018. ^ "Scorecard: First Test, India in South Africa, 2001/02". ESPNcricinfo. Archived from the original on 7 March 2018. Retrieved 15 September 2018. ^ "Scorecard: Second Test, India in South Africa, 2001/02". ESPNcricinfo. Archived from the original on 6 March 2018. Retrieved 15 September 2018. ^ Premachandran, Dileep (1 December 2001). "The gleam of bone". ESPNcricinfo. Archived from the original on 15 September 2018. Retrieved 15 September 2018. ^ "Scorecard: 'Unoffical' Third Test, India in South Africa, 2001/02". ESPNcricinfo. Archived from the original on 7 March 2018. Retrieved 15 September 2018. ^ a b Prabhudesai, Devendra (December 2005). "One For A Crisis". The Nice Guy Who Finished First: A Biography Of Rahul Dravid. New Delhi, Ind: Rupa Publications. pp. 102–7. ISBN 978-81-291-16505. ^ "Cricinfo – 2nd Test: Australia v India at Adelaide, Dec 12–16, 2003". Content-ind.cricinfo.com. Retrieved 20 December 2010. ^ "Multan Test, Statistical Highlights". Rediff. 2 April 2004. Archived from the original on 26 March 2014. Retrieved 18 October 2013. ^ "Cricinfo – 3rd Test: Pakistan v India at Rawalpindi, Apr 13–16, 2004". Content-ind.cricinfo.com. Retrieved 20 December 2010. ^ 1st Test: England v India at Lord's, Jul 21–25, 2011 | Cricket Scorecard Archived 13 November 2012 at the Wayback Machine. ESPN Cricinfo. Retrieved on 2013-12-23. ^ 2nd Test: England v India at Nottingham, Jul 29 – Aug 1, 2011 | Cricket Scorecard Archived 13 November 2012 at the Wayback Machine. ESPN Cricinfo. Retrieved on 2013-12-23. ^ 3rd Test: England v India at Birmingham, Aug 10–13, 2011 | Cricket Scorecard Archived 13 November 2012 at the Wayback Machine. ESPN Cricinfo. Retrieved on 2013-12-23. ^ 4th Test: England v India at The Oval, Aug 18–22, 2011 | Cricket Scorecard Archived 22 January 2015 at the Wayback Machine. ESPN Cricinfo. Retrieved on 2013-12-23. ^ England v India: Rahul Dravid deserves our respect after frustrating England Archived 28 June 2013 at the Wayback Machine. Telegraph. Retrieved on 2013-12-23. ^ "I had a satisfying ODI career: Rahul Dravid". The Times of India. 16 September 2011. Retrieved 9 March 2012. ^ "Rahul Dravid says thanks but no thanks". Daily News and Analysis. 7 August 2011. Retrieved 9 March 2012. ^ Davies, Will. "Rahul Dravid Bows Out in Style". ^ "Dravid retires from T20I". Archived from the original on 27 February 2012. Retrieved 31 August 2011. ^ "Full text of Rahul Dravid's retirement speech". IANS. 9 March 2012. ^ "Rahul Dravid announces retirement from international cricket". The Times of India. 9 March 2012. Archived from the original on 9 March 2012. Retrieved 9 March 2012. ^ "Statistics / Statsguru / RS Dravid /One-Day Internationals". Cricinfo. Archived from the original on 8 February 2016. Retrieved 25 April 2012. ^ "List of Test victories". Cricinfo. Archived from the original on 25 April 2012. Retrieved 25 April 2012. ^ "IPL Records-Most Runs". Cricinfo. Archived from the original on 3 February 2013. Retrieved 25 April 2012. ^ "CLT20 Records-Most Runs". Cricinfo. Archived from the original on 1 October 2013. Retrieved 25 April 2012. ^ Never thought I'd play T20 cricket for so long, an emotional Dravid bids farewell : Featured, News – India Today Archived 30 October 2013 at the Wayback Machine. Indiatoday.intoday.in (2013-10-07). Retrieved on 2013-12-23. ^ "Rahul Dravid leaves greater T20 legacy than Sachin Tendulkar – Firstpost". 8 October 2013. Archived from the original on 10 October 2013. ^ a b Rahul Dravid- Analysis of Performances at Home and Away Archived 24 November 2009 at the Wayback Machine. Retrieved 23 November 2010. ^ "Rahul Dravid away batting stats in ODI". Retrieved 23 November 2010. ^ "Rahul Dravid home batting stats in ODI". Archived from the original on 7 August 2013. Retrieved 23 November 2010. ^ "Rahul Dravid Test analysis in matches won". Retrieved 23 November 2010. ^ "Rahul Dravid ODI analysis in matches won". Retrieved 23 November 2010. ^ "Dravid, Laxman real class: McGrath". rediff.com. 21 December 2003. ^ "Cricinfo – The Man Fridays". Content-usa.cricinfo.com. Archived from the original on 23 January 2007. Retrieved 20 December 2010. ^ "Dravid could have even been called 'The fortress': Warne". PTI. 3 December 2008. ^ "Dravid reaches Test runs landmark". BBC News. 29 March 2008. Archived from the original on 26 March 2012. Retrieved 20 December 2010. ^ a b c d "Ball tampering was deliberate, says Lloyd". Sydney Morning Herald. 22 January 2004. Archived from the original on 6 November 2012. Retrieved 31 July 2010. ^ a b "Wright defends Dravid in ball-tampering case". cricinfo.com. ESPN cricinfo. Archived from the original on 3 March 2010. Retrieved 31 July 2010. ^ "Multan declaration was a mistake: Ganguly". The Hindu. Chennai, India. 30 April 2004. Archived from the original on 1 September 2005. ^ "Shastri criticises Dravid". The Hindu. Chennai, India. 25 September 2006. Archived from the original on 19 October 2007. ^ "Pathan's destiny is in his own hands: Dravid". Zee News. 9 October 2006. Archived from the original on 30 September 2007. Retrieved 20 December 2010. ^ "Cricinfo – Dravid regrets top-order failure". Content-ind.cricinfo.com. Archived from the original on 23 August 2007. Retrieved 20 December 2010. ^ "Dravid receives Arjuna Award". Tribuneindia. Retrieved 24 August 2012. ^ "Rahul Dravid awarded Padma Shri". Deccan Herald. 1 July 2004. Archived from the original on September 7, 2006. Retrieved 2007-03-27. ^ "Rahul Dravid – Wisden Cricketer of the Year". Wisden Almanack. Retrieved 2007-03-27. ^ a b "Dravid walks away with honours". Chennai, India: The Hindu. 9 September 2004. Retrieved 2007-03-27. ^ "ICC Test Team Captain 2006". Rediff. 3 November 2006. Retrieved 2007-03-27. ^ "HISTORY-CHANGING COLOSSUS". Wisden India Impact Index. Archived from the original on 14 January 2016. Retrieved 2 January 2016. ^ "Dravid weds Vijeta Pendharkar". Archived from the original on 2 April 2007. Retrieved 6 May 2007. ^ "Dravid blessed with a baby boy". Archived from the original on 29 March 2007. Retrieved 6 May 2007. ^ "Dravid becomes a dad again". Archived from the original on 1 May 2009. Retrieved 29 April 2009. ^ "3 more ambassadors for Reebok". The Hindu Business Line. 7 May 2004. Archived from the original on 6 August 2012. Retrieved 27 March 2007. ^ "Rahul Dravid to be the brand ambassador of Pepsi". Rediff. 10 June 1997. Archived from the original on 21 October 2007. Retrieved 27 March 2007. ^ "Rahul Dravid to be the brand ambassador of". The Tribune. India. 12 May 2002. Archived from the original on 30 September 2007. Retrieved 27 March 2007. ^ "Rahul Dravid to be the brand ambassador of Castrol". The Hindu Business Line. 16 February 2001. Archived from the original on 21 October 2007. Retrieved 27 March 2007. ^ Argenti (2007). Strategic Corporate Communication. Tata McGraw-Hill Education. p. 71. You might know that Sachin Tendulkar, a star Cricketer, is a brand ambassador for Airtel and Rahul Dravid, another star cricketer, is brand ambassador for Hutch. ^ "Rahul Dravid to be the honorary brand ambassador of Karnataka Tourism". The Times of India. India. 23 February 2004. Retrieved 27 March 2007. ^ "Rahul Dravid to be the brand ambassador of Max Life Insurance". Sify. 27 April 2005. Archived from the original on 1 September 2007. Retrieved 27 March 2007. ^ "Rahul Dravid to be the brand ambassador of Bank of Baroda". The Hindu Business Line. 7 June 2005. Archived from the original on 2 January 2007. Retrieved 27 March 2007. ^ "Rahul Dravid to be the brand ambassador of Citizen Watches". The Hindu Business Line. 9 May 2006. Archived from the original on 9 February 2007. Retrieved 27 March 2007. ^ "Rahul Dravid to be the brand ambassador of Skyline Construction". Rediff. 10 November 2006. Archived from the original on 6 December 2006. Retrieved 27 March 2007. ^ Tuesday, 27 March 2007 at 0005 hrs IST (27 March 2007). "Videocon, Sansui declare Dhoni, Dravid out of ads". The Financial Express. Archived from the original on 14 December 2013. Retrieved 20 December 2010. ^ Mehta, Mona (15 September 2007). "India Inc stands behind 'The Wall'". The Financial Express. Archived from the original on 14 December 2013. Retrieved 19 December 2010. ^ "Samsung to spend Rs 20–25 crore between Jan–March 2003 on cricket > afaqs! news & features". Afaqs.com. 11 December 2002. Retrieved 20 December 2010. ^ Sydenham, Richard (28 March 2004). "Pakistan-India Cricket Series Spurs $40 million Marketing Boon". Bloomberg. Archived from the original on 3 November 2012. Retrieved 20 December 2010. ^ "Rahul Dravid is the Brand Ambassador of World Trade Center Noida". Biharprabha News. Archived from the original on 18 November 2013. Retrieved 15 November 2013. ^ "The Great Wall of India". Children's Movement for Civic Awareness. September 2004. Archived from the original on 16 July 2011. Retrieved 24 March 2011. ^ "Testimonials". Children's Movement for Civic Awareness. Archived from the original on 19 July 2011. Retrieved 24 March 2011. ^ "Rahul Dravid leads AIDS Awareness Campaign". Indian Television.com. 16 July 2004. Archived from the original on 23 November 2008. Retrieved 27 March 2007. ^ "Book Review – Rahul Dravid, A Biography". Archived from the original on 30 September 2007. Retrieved 27 March 2007. ^ "Book Launch:The Nice Guy Who Finished First". Rediff. 2005-11-17. Archived from the original on 22 October 2007. Retrieved 27 March 2007. 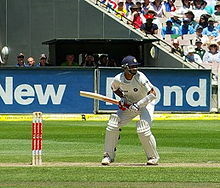 Wikimedia Commons has media related to Rahul Dravid.